Are you concerned about climate change? According to a new billboard campaign by the right-wing Heartland Institute, that makes you no different than the Unabomber, Fidel Castro, or Charles Manson. The first billboard went up in the Chicago area this week. I’ve written about nutty corporate ads labeling animal environmentalists and animal rights activists as terrorists, but this goes even further. It doesn’t matter whether or not you’re an activist, the Heartland Institute says, because even thinking about these things makes you dangerous. 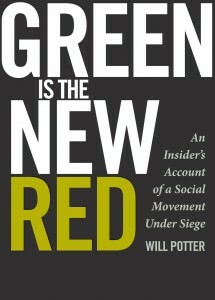 Learn more about how corporations manufactured the idea of "eco-terrorism," and the impact of media stunts like this. Because what these murderers and madmen have said differs very little from what spokespersons for the United Nations, journalists for the “mainstream” media, and liberal politicians say about global warming. They are so similar, in fact, that a Web site has a quiz that asks if you can tell the difference between what Ted Kaczynski, the Unabomber, wrote in his “Manifesto” and what Al Gore wrote in his book, Earth in the Balance.The point is that believing in global warming is not “mainstream,” smart, or sophisticated. In fact, it is just the opposite of those things. Still believing in man-made global warming – after all the scientific discoveries and revelations that point against this theory – is more than a little nutty. In fact, some really crazy people use it to justify immoral and frightening behavior. Heartland is the engine behind climate change denialist efforts around the country. The group doesn’t reveal its funding sources, but Desmogblog obtained internal documents that show funding from ExxonMobil, GlaxosSmithKline, and Pfizer among others. Heartland is also a member of the American Legislative Exchange Council, including its Energy, Environment and Agriculture Task Force (here’s more about ALEC’s ties to recent Ag Gag bills). The corporations mentioned above are ALEC members also. According to Heartland, there are also plans in the works for comparing “global warming believers” to Osama bin Laden. In related news, I heard from reliable sources that Timothy McVeigh believed in gravity. YOU DON’T WANT TO BE LIKE THE OKLAHOMA CITY BOMBER, DO YOU?!?! UPDATE: New York Times reports that, responding to public outrage, Heartland Institute pulls the billboard.